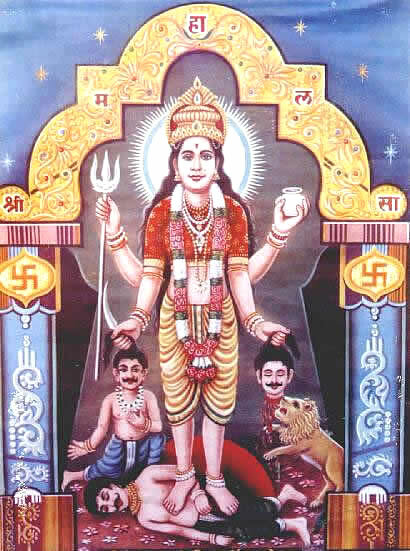 SHRI MAHALASA NARAYANI is the powerful Kuladevata (family deity) of many Hindus, especially in western and southern India. ‘Mahalasa’ is another name for the Supreme Lord Vishnu’s famous avatar (incarnation): Mohini, the Enchantress. Temples dedicated to the worship of Shri Mahalasa Narayani are present in Maharashtra, Goa, Karnataka, Kerala and many other places. The most popular temple of Supreme Mother Mahalasa is at Mardol in Goa, which is over 450 years old. Other temples, like the ones in Kumta and Basrur, both in Karnataka, are also said to be over 400 years old. Yet, Shri Mahalasa Narayani has other ancient and historic temples dedicated to Her, including at Nevase in Ahmednagar district of Maharashtra, where she is known as Shri Mohiniraj of the Amrut Manthan (the epic churning of the ocean) fame. It is believed that it is from Nevase that Shri Mahalasa Narayani came to Verna in Gomantak, that is present-day Goa. Before Nevase, there is a Mohini temple in Nepal, near the world-famous Pashupatinath temple. However, one temple to Amma Mahalasa that deserves special mention here is the scenic spiritual center at the idyllic Harikhandige village in Udupi district of coastal Karnataka. Nestled amidst hills & forests, Shri Mahalasa Narayani Devi Kshetra campus is an ideal example of deep faith, devotion, dedication and sacrifice exhibited by Her devotees. Constructed just over decade ago, the Harikhandige temple, by far, is growing more and more popular with every passing day as stories of Her miracles here abound! And, all because of one divine person, Her Blessed Son, whom many consider as a living God: His Holiness Guruji Shri Suresh J Pai. This portal, consisting of information from many of Her temples, is a humble service to the almighty Beloved Kuladevata, and a contribution to millions of Her devotees by providing them information about Shri Mahalasa Narayani and Her infinite greatness; about many of the temples dedicated to Her, various alankaars (appearances), stotras and stuthis, audios, videos, and so on. And, not to forget, the nectar of information—inspired by Herself—in the form Her Charitra, the Holy Book that has given immense inspiration and relief from wordly difficulties, to Her devotees. To get more information on how to receive Her grace, click on the Charitra page. This portal also provides an opportunity to devotees, who are otherwise constrained by distance and time, to perform a Seva to Shri Mahalasa Narayani on a date and time of their choice and receive Her Prasad and, more importantly, Her infinite love and blessings! Please visit the Seva page for details. The most popular section of this portal is the Panchang section (at left), which gives you the tithis & festivals of the day and week ahead and events at Her various temples (from where we receive regular information). The Panchang page gives you the entire month’s calendar of tithis and events. This site, first created in 1998, continues to grow as we receive more and more information about Shri Mahalasa Narayani and Her infinite glories. Apart from this portal, separate websites have been created as subdomains for several temples. Click on the Temple link in the navigation bar above to explore Her various temples from the drop-down menu. Please remember to visit this Temple on the Internet regularly to receive Mother Mahalasa’s blessings and also share this useful information with your family and friends. Also, don’t forget to join hundreds of our subscribers (kulavis and non-kulavis alike) who receive our must-have FREE Daily Panchang & Events mailer along with prayers for the well-being and prosperity of you and your family, right into your e-mail inbox—a day in advance. For details, click here.